Add 1,5 or 10 tubes to the basket and SAVE on Unit Price.... The more you buy the more you SAVE!!!! Add 1,5 or 10 tubes to the basket and Save on Unit Price....The more you buy the more you save!!!! 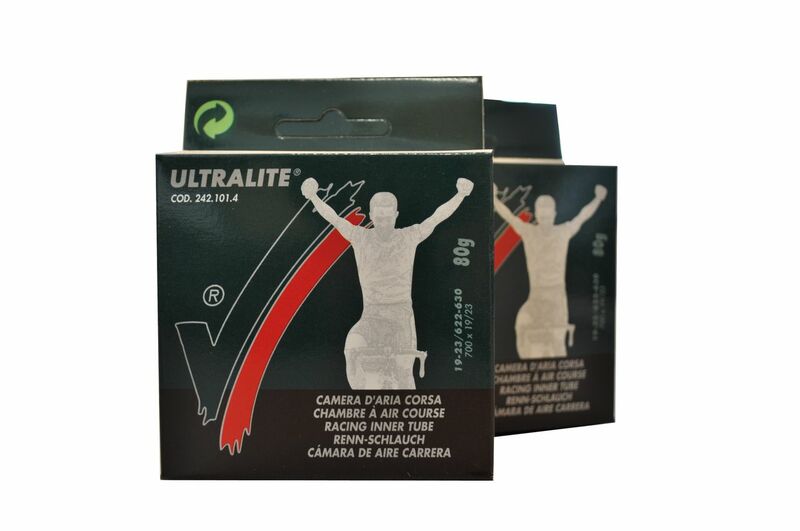 Both the Ultralite and the Lite Vittoria tubes are good value for money. They're reliable and well priced and consequently these are my 'go to' inner tubes. They've never let me down yet. I definitely recommend them. Good quality, light weight tube. Reasonably light and they hold pressure. At this price, I cant be bothered to repair punctures! Good tubes so far no problems after about three hundred miles on them. Great tubes at an excellent price. These tubes have the perfect length valve for 25mm deep rim and unlike most other brands don't stick out miles. They come wound tight and thus slip verry easily into your back pocket or saddle bag. I had struggled finding the correct size tube until I came across the vittoria 700c inner tubes. They arrived promptly and are packaged in a small box meaning I can carry the spare boxed up. Great value and discount on the more you order. They inflated well and appear well made. I ride on some very poorly tarmacked roads and they are holding up well. My go-to tubes, never had a bad one. Great tubes, fairly lightweight. Great service from Merlin as always. Light, robust, fit easily, air tight, cheap. Ordered them yet? Very light for a good price. It's the best option for those who want to have a light weight clincher wheelset. I use vittoria tyres exclusively so I use their inner tubes also. 10/10 Especially with Merlins bulk buy. These are seriously lightweight tubes! Went in easily have been spot on so far. Does what it says on the tin. Fill it with air and it stays there! Light and reliable as far tubes go. I race and train with these all the time. I have used the Vittoria tubes for years and had mostly good results. Easy to install , light weight, and reasonably priced. I seem to get as good or better reliability with these as I do with tubes costing twice as much.